A clean build with meticulous cable management can resemble a work of art and if you're up to the task, there are cases out there that will put your talent on full display. Not just cases with side windows, mind you, but ones like Thermaltake's new Core P1 TG that can be mounted to the wall. The new Core P1 TG is the latest addition to Thermaltake's wall mountable Core P series. This one is different from the others in that it's smaller and only supports mini-ITX motherboards. Otherwise, it shares numerous traits with its bigger brothers, including an open air design, a tempered glass panel, and of course the ability to hang it up like a Rembrandt or stand it on up on two large plastic feet. I built my main system inside Thermaltake's Core P5, a larger version of the Core P1 TG. It sits on a stand/cabinet rather than the wall but is still an attention grabber. It was fairly easy to build in, though the one challenge is organizing input cables that dangle from the side, such as the ones for your mouse, keyboard, PSU power cord, audio cables, display cable, and whatever else is attached to your PC. The Core P1 TG uses modular trays to support up to four drives. Other parts are modular too, so you can mold the case to how you plan to orient it, whether on a wall, vertical, or horizontal. However it's configured, Thermaltake's Core P series looks best with a water cooling setup. To that end, Thermaltake also announced what it claims is the first world's first pure black coolant as part of its non-transparent C1000 series launched last year. The black coolant option joins blue, purple, white, red, orange, yellow, and green. 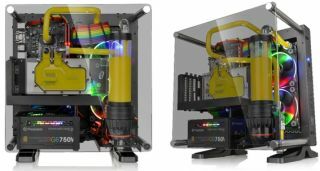 Thermaltake says its C1000 coolant is ready to use with at least a 3-year shelf life in airtight containers. These coolants can withstand temperatures ranging from 165C (boiling point) to -20C (freezing point). No word yet on when the Core P1 TG or C1000 in black will be available or for how much.